Hoo-hoo-hoo made this annoying game? At first glance, Silly Owls has all the makings of a fun casual game. There's the tried and true "grab three stars to succeed" formula for success, followed by spot on touch controls and of course, some adorable characters. That said, five minutes was all it took to never want to play this app again. Developer Pinch Games created one of the toughest and most annoying titles we've experienced, a game so unfair and irritating that every admirable quality (an owl riding a banana skateboard, for instance) gets drowned in the wake of frustration, where every painful second is spent haphazardly poking the touch screen until steam shoots from our ears. 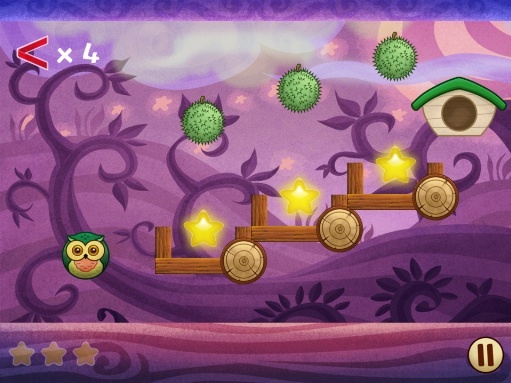 The first set of puzzles challenge you to get an owl to its home via slingshot, grabbing stars along the way. Hit one of the spiny pieces of fruit, and the board automatically resets, which also means it puts collected stars back into place. The designers want you to use a limited number of turns, which amounts to launching the owl, stopping it with your fingers mid flight and then firing it in a different direction, which is downright awful. Expect many painful restarts. Then we have the rolling puzzles, where you set the owl in motion and attempt to save it from death by tapping apples that bounce the bird to safety; the owl can also roll atop the apples. It's a bit easier than dodging spiny fruit, but we can't help but feel this game type could've been executed better. Finally, we have the banana skateboard mission, where you leap over and duck under obstacles to achieve a high score. It's without question the best part of the game, despite being a tad bit pretentious. Why the owl chose to ride a banana escapes us, but it's probably hilarious to the person who came up with the idea. We'd say that on the positive side, the game comes with a bunch of levels, but it's 60 stages of pain. Look, we get it. They're not angry birds. They're silly owls. Cue the laugh track. That's fine, but there needs to be a good game to back up the supposedly kooky protagonists, and unfortunately, we couldn't find one. Requirements: Compatible with iPhone, iPod touch, and iPad. Requires iOS 3.2.0 or later. 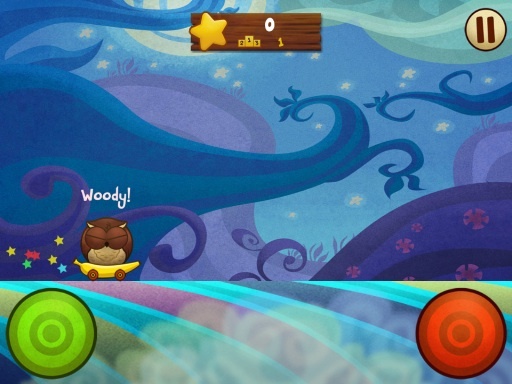 What's Hot: Universal support, banana skateboard level, attractive backgrounds.